Want to talk to Kay about her books, her cats, her garden or travels? Catch up with all the news on her Facebook page. Looking forward to hearing from you! It’s not enough that the perky redhead has been in his way from Dallas to Orlando, but now a hotel suite mix-up has David White sharing a living room with her, her mother and her niece. How’s a man supposed to conduct business at the convenience store convention and still have time to prep for a job interview with WOTs-New-Now’s president? Somehow wanting to jump ship from his dead end job has him jumping through hoops for her instead. Even though she’s a vice-president of the family business, Megan O’Toole is less than pleased when her father delegates a job interview to her while she’s in Orlando. Add to that, her mother and niece are along for the ride and the hotel has mixed up the reservation so that they’re sharing quarters with a too handsome man and his twin brothers! Their chemistry is off the wall, making her forget that she has a job to do. 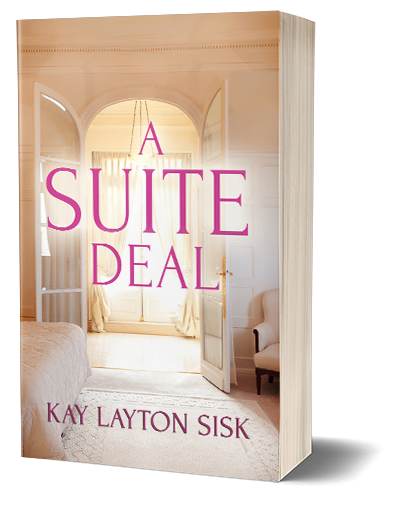 Is it a case of miscommunication and misdirection or simply A Suite Deal?